Whale Sharks are the largest fish in the ocean, they can grow up to an amazing forty foot long. Whale sharks are a common sighting in the Maldives. 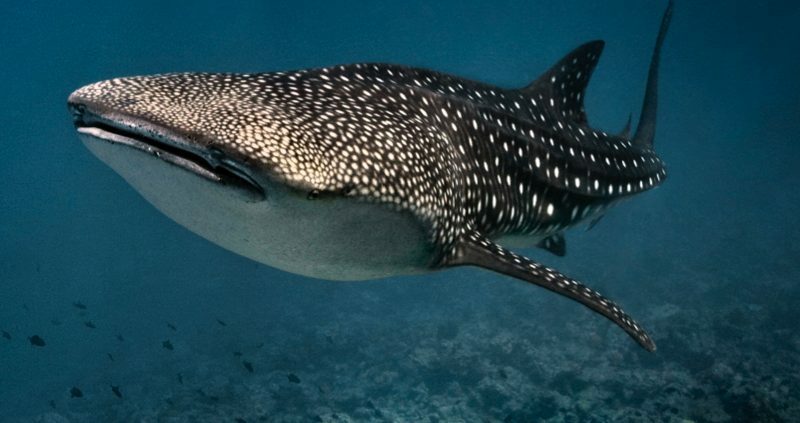 It used to be that Whale Sharks in the Maldives were sighted in the southwest monsoon season, but because of environmental changes, that includes higher water temperatures and higher levels of plankton Whale Sharks can now be found swimming around the Maldives and in particular, the Ari and Baa Atolls through the year. The Whale Shark has a mouth that can open an incredible five feet and has hundreds of rows of small teeth. The Whale Shark has five sets of gills, all of which are huge. Whale Sharks in the Maldives do not attack people, they are not a threat and are a wonderful sight to behold. They are calm and placid, dark in colour with white spotted patterns on its back. Whale Sharks feed on algae, plankton, larvae and small fish. Together with the Basking Shark and the Megamouth Shark they are the only filter feeding sharks in existence. One of the best things about Whale Sharks in the Maldives is you do not need to scuba dive to enjoy bumping into a Whale Shark. You merely jump in with them and age can jump in and snorkel around with these incredible fish. The Maldives Whale Shark Research Programme (MWSRP) is a charity that carries out whale shark research and fosters community focused conservation initiatives in the Maldives. What started as a scientific mission in 2006, the MWSRP has developed to become the only long term organisation committed to the study of the iconic Whale Shark. Whale Sharks in the Maldives are endangered by fishing practices. As there are no records about the sharks populations we are not really fully aware of how endangered the Whale Shark is. The International Union for the Conservation of Nature believes that they are very at risk. It is forbidden to fish for whale sharks in the Maldives and the sale of any shark products is also illegal.